The second largest Thai island was a military exclusion zone until the end of the 1980s. Since then, the government decided to develop Koh Chang to a new holiday destination like Koh Samui or Phuket, to support the development of eastern Thailand, but preserving nature by declaring the island and the surrounding sea as a marine national park. The infrastructure was built up rapidly and tourism started to grow. The ring road around the island is nearly finished since 2005, only the last connection in the southernmost part is missing due to steep and difficult rainforest conditions. So now nearly every coastal place can be reached by car and motorbike and the road between Ban Bang Bao and Salak Phet will be open in the near future (is under construction). However, the southernmost part of Koh Chang with the Long Beach is still very difficult to reach and the road is very steep and dirty and can easily be washed away by heavy monsoon rainfalls. The Long Beach itself is not very beautiful and has only one very simple backpacker resort till now. Some parts of the famous beaches, such as White Sand Beach (Had Sai Kao) and the Klong Phrao Beach are intensively developed, many bungalow resorts and luxury hotel complexes have been built. The mass tourism is growing strongly and prices are rising by leaps and bounds. Other beaches are the Lonely Beach (Had Thanam - including Siam Beach), the Kai Bae Beach, the Bang Bao Beach and Long Beach in the far south. However Koh Chang is still very beautiful with simply magnificent and great island landscapes. The rainforest grow into the villages and very near to the beaches. Koh Chang National Park means untouched tropical rainforest in the interior of the island, reaching summits up to 800m hight. Most of the palm tree covered sandy beaches are beautiful and clean. They are all located on the west coast with spectacular sunsets. However, they are not lonely any longer, as they have been in the early 1990s. Almost all beaches have many hotel resorts which are fully booked during season times. Shops, restaurants, bars and suppliers emerging in growing numbers. Elephant treckings can be made into the interior island with beautiful waterfalls and healthy rainforest nature. The most recommended is the Elephant trekking which operates from Ban Klong Son in the north. Of course, diving and snorkeling is possible and offered everywhere around the island. The water is crystal clear and warm. It is hoped, that, despite of the governments plans, the beauty and naturalness of the island will not be lost. The eastern side of Koh Chang presents itself very differently from the western part. Here it is still very quiet. There are no spectacular beaches and only little infrastructure. Here one can enjoy the beauty of the nature very intensely. The capital village of Salak Phet is situated at the large bay with the same name. Two islands (Koh Phra Noi and Koh Phra Nok) and the high surrounding mountains are covered with rainforest and provide a very beautiful landscape. Some simple accommodations and restaurants can be found, and from here you can explore this part of the island individually by motorbike or guided excursions. Worth seeing are the waterfalls (especially the Yom Thaan Ma), the mangrove swamp at Salak Khok Bay and the bay itself, which can be overseen from several viewpoints along the road towards Long Beach. Rainforest trekking has become increasingly popular in the last years. But good sportive condition and spirit is required for the tiring tours into the humid mountain forests. An insider tip to visit is the only by boat achievable, very beautiful and small palm beach Had Wai Chek on the south coast. For sailing friends the Salak Phet Bay provides a modern Marina with large sailing boats for rent. 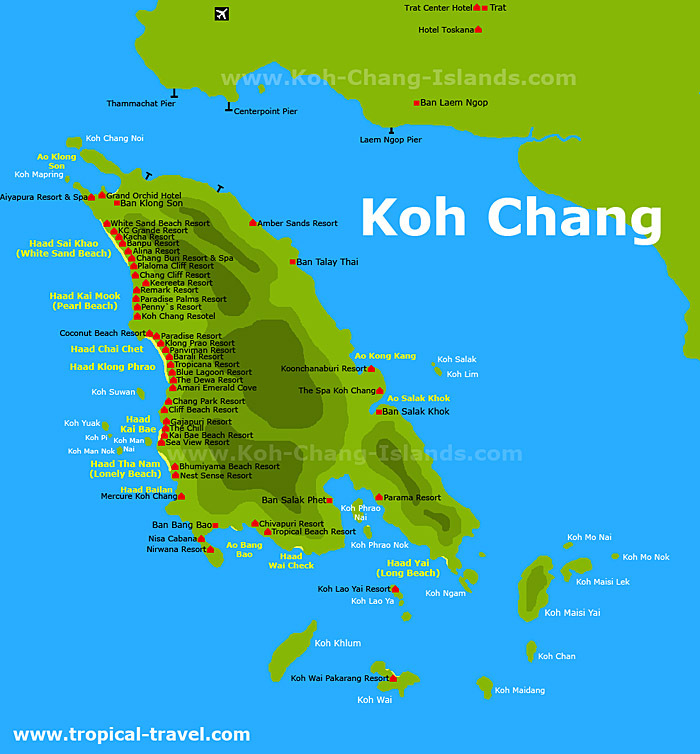 Koh Chang means "elephant island" because the mountain ridge should look like a herd of elephants. It is 30 km long and 13 km wide and is situated near to the Cambodian border. Malaria prophylaxis is advised, although the situation has improved during the last years. Sand flies are no longer a problem. At the four main beaches (White Sands, Klong Phrao, Kai Bae, Lonely Beach) on the west coast of tropical rainforest grows down to the beaches, mostly decorated with coconut palm trees, getting close to the image of the dream of tropical beaches. The beaches in the south still offer some quiet and restfulness during the low season. Otherwise construction sites are everywhere. Most bungalow are located on the beach under palm trees or casuarina trees. Restaurants build up their tables on the beaches every night and offer fresh fish and candlelight with fire shows and other simple entertainments. On Koh Chang, time passes even slower, hectic and stress are far away, but evening or nightlife entertainment, which was unknown until recently, is now developing in the manner and style of Phuket with numbers of beer bars at White Sands and Klong Phrao. However, noise and stench, as on Samui and Phuket, there is none. Pittyful, that many resort facilities are not cared for as necessary and seem to be outdated only after a few years. This is particularly the fact close to White Sand Beach. Take the overland bus from the eastern bus terminal (Ekamai) or Morchit Busterminal to Trat. The fare per person is about 200-300 baht in ac bus. Friendly staff helps tourists to find the right bus. Try to leave very early in the morning to be able to reach a boot to the islands. The bus needs about five hours to Trat. From there, go by taxi to Laem Ngop to the pier. Car ferries run every hour at daytime. In the high season there are also buses directly to Laem Ngop pier. They leave Bangkok about 9 am. Having arrived on Koh Chang, pickup taxis bring all guests to their hotels for fixed prices. The price for the taxi to locations on the east of Koh Chang depends on the distance. To the beaches of the west coast, one pay 100-200 baht, if enough people fill up the car. 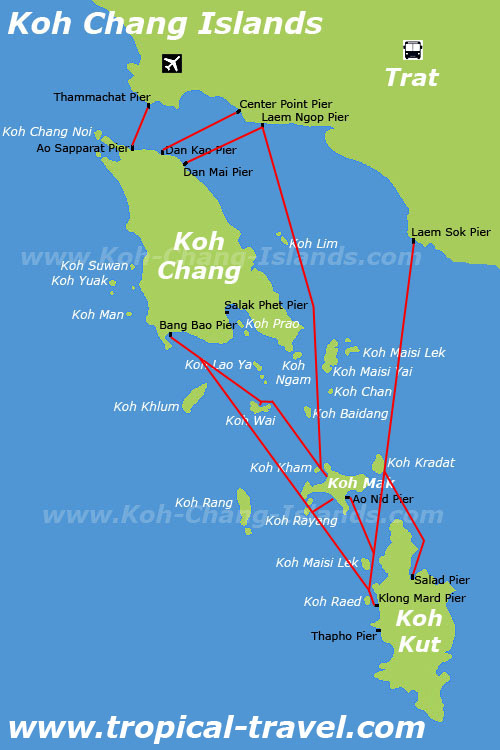 To reach Koh Chang from the other islands is possible by speedboats and express boats. They connect Koh Kood with Koh Chang via Koh Mak and Koh Wai. It is worth a stopover on the tiny island of Koh Wai for snorkeling. Flights from Bangkok Suvarnabhumi are available three times daily by Bangkokair. The short flight lasts only 50 minutes. The airport is located 30 Km west of Trat town and north of the car ferries to Koh Chang. 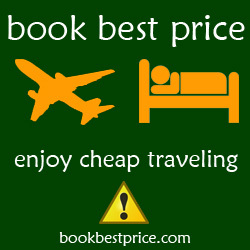 Informations and online booking on Bangkokair.com. On the beaches there are a variety of bungalow units with simple bamboo huts and better air-conditioned cabins, and several hotels. Some resorts still offer very simple and cheap huts, but the trend towards expensive (sometimes overpriced) hotels and resorts is unmistakable. The prices seem to rise steadily with the openeing of new hotels. Even at the former backpacker idyll, the Lonely Beach, luxury tourists appear and the charm of the early years has disappeared. The long Klong Prao Beach is now equiped with many modern pool resorts. But this beach still has enough space for some lonely places on the beach. In the south of Koh Chang, Bag Bao Beach (Klong Kloi Beach) is a nice and quiet place to stay for a day or rent a simple bungalow or even a luxury accomodation onthe beach. On White Sand Beach the KC Grande Resort and the Banpu Resort can be recommended. The KC Grande Resort is located on the only really beautiful section of the White Sand Beaches and offers very beautiful, but more expensive bungalows under palm trees right on the beach. However, this resort has been built a new huge building at the roadside, which seems not to fit to a paradise place. The old small wooden huts on the beach have now disappeared. At the northern part of White Sand Beach, away from the roadside and from the town, the White Sand Beach Resort offers quite good bungalows, combining stillness and nice sandy beach. At Klong Prao Beach the Santhiya Tree Resort is one of the best and most expensive hotels on Koh Chang. Right next door the Tiger Hut Resort offers very simple and cheap wooden huts (500 baht per night). The contrast can not be bigger. Another nice resort on Klong Prao Beach is Centara Tropicana. Two pools and a big tropical garden with rooms and bungalows among coconut palms on one of the most beautiful beach sections. For those, who do not necessarily wish to live directly on the beach, good rooms and cheap accommodation can be found in the villages along the main road. In White Sands, for example, you can have a cheap and clean room at the centrally located Alina Grande Resort. You just cross the road to reach the beach in one minute. In the east at the Salak Phet Bay we recommend The Spa Koh Chang Resort offering one of the best Spa treatments on Koh Chang.